Here we are giving information related to Train ticket fare/ Platform ticket fare details by Indian Railway and IRCTC. We are giving details related to Railway Platform Tickets, Train Ticket including AC/Non-AC/Sleeper/General Tickets and fare details of trains including Rajdhani, Shatabdi and Duronto etc. Following are the details. Anubhuti coach shall be attached in Shatabdi trains as additional Executive Class where there is only one EC Coach and where there is two or more EC coach then one of existing executive class coach may be replaced by Anubhuti coach. The fare of Anubhuti coach attached in Shatabdi trains shall be 1.2 times of executive class fare of Shatabdi trains. In exceptional cases where Anubhuti coach is to be attached in Gatimaan Express and Tejas Express as replacement of existing Executive class and then fare shall be same as that of Executive class coaches of respective mentioned trains. Other charges like reservation fee, super fast surcharge, Goods and service tax etc., as applicable shall be levied separately. Normal Child fare rules will apply. No concessional tickets and tickets against Free complimentary passes which are not fully reimbursed shall be admissible in this coach. Booking of tickets against Passes issued to Member of Parliaments and Rail travel coupons (RTCs) issued to MLA/NALGs-shall be permissible as they are fully reimbursed. The eligibility of Privilege pass/PTO for Railway employees shall be on par with eligibility in the respective class of trains in which such coaches are attached etc.,. Full fare Defence warrants shall be allowed for exchange as per the actual fare. 3.0 Vacant berths left at the time of first charting would be offered for current booking. Tickets under current booking shall be sold at the last price sold for that class with 10% discount on last price and other supplementary charges like reservation fee, super fast charges, Goods and service tax etc., as applicable shall be levied in full. Base fare of the single journey of AC EMU shall be 1.3 times of the base fare of existing fare of single journey ticket for first class. However as an introductory offer for a period of initial six months, the base fare of single journey of AC EMU shall be charged 1.2 times of the base fare of existing fare of single journey ticket of first class. The difference between 1.3 times and 1.2 times will be shown in the ticket as discount during the introductory period. 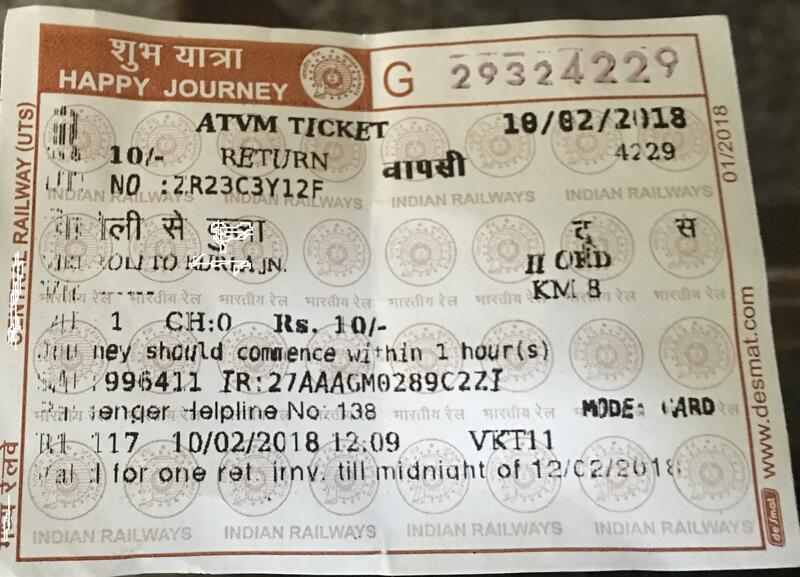 Season tickets :- Weekly, Fortnightly and monthly season tickets shall be charged equivalent to 5, 7.5 and 10 single journey of AC EMU respectively. No other type of season tickets shall be issued for the time being. AC EMU ticket holder shall also be allowed to travel by first class compartments of local trains. Goods and Service Tax (GST) @ 5% shall be levied on the total fare as per the existing principle. AC EMU ticket holder shall also be allowed to travel by first class compartment of local trains-. Announcement shall be made as more trains are introduced, the regular fare shall be 1.3 times of the basic fare of First class single journey tickets and other applicable supplementary charges. All other terms and conditions for issue of journey tickets/season tickets shall be same. Central Railway announced the fare of Mumbai and Madgaon Vista Dome Coaches. Following are the details. Fare will be equivalent to that of Executive class in Shatabdi Express without Catering charges. Reservation Charges, GST and any other charges will be levied in addition to the basic fare. There shall be no concession and all passengers will be charged at full fare. Minimum chargeable distance shall be 50 km. In order to regulate the flow of public to enter onto the platform and to avoid inconvenience to the Bonafide passengers during the ensuring festive Season, the rate of Platform Ticket at Secunderabad and Hyderabad Railway Stations will be enhanced from present Rs.10/- to Rs.20/- for a period of 09 days i.e from 09.01.2019 to 17.01.2019.